Can Animal Behavior Help Us Understand Empathy and Dehumanization? She was just thirteen years old when my grandmother last saw her parents at Auschwitz. On Holocaust Remembrance Day, it's worth pausing to reflect on how our species led my grandmother to find herself in such a horrific place, and how it might have been avoided. My grandmother was born in a small town in Czechoslovakia called Sobrance on November 5, 1930, though she grew up in a nearby village called Nagy-Muzsaly. Her father's family owned land, something very rare for Jewish families at the time in that part of the world. They used their land to produce wine, and my grandmother spent many days in her early years playing in the caves on their land, where her family stored the wine barrels. But when she was thirteen years old, on the last day of Passover in 1944, the Nazis took her to the ghetto at Beregszas, in Hungary, along with her three sisters and her parents. 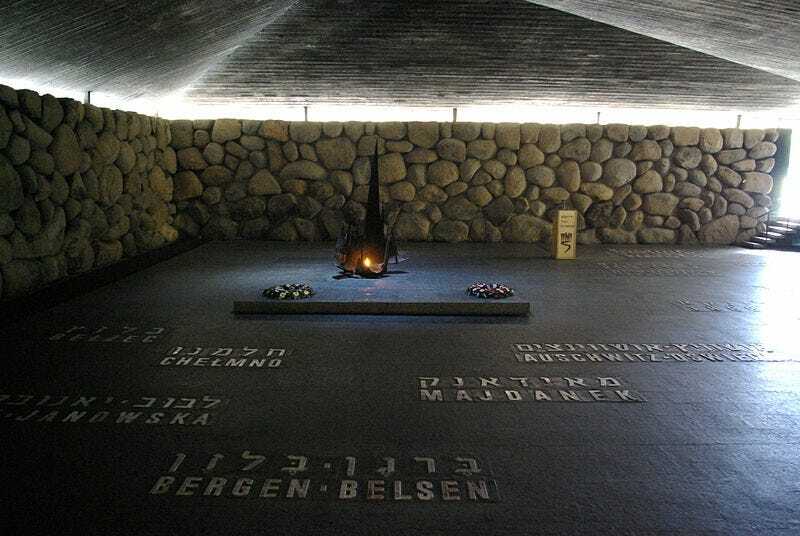 Above: Hall of Remembrance at Israel's Holocaust Museum, Yad Vashem, in Jerusalem. Berthold Werner/Public domain. Humans are a confusing species. On the one hand, we tend to see humanness everywhere. "Our planet is currently inhabited by approximately 1.75 million known species with unique phylogenetic characteristics, at least 10,000 distinct religions each describing its own set of supernatural beings, and an exponentially expanding number of technological devices designed to ease the burdens of every day life," write psychologists Nicholas Epley, Adam Waytz, and John T. Cacioppo, in a 2007 paper in the journal Psychological Review. It is curious, then, that people's mental representations of those species, supernatural beings, and technological devices are overwhelmingly familiar. "Animals are imbued with humanlike intentions, motivations, and goals. Spiritual deities are embodied with fingers and facial hair, complete with personality strengths and occasionally personality weakness. And even the most technologically savvy have wondered, at least for a moment, whether their computer is plotting against them." We see non-human agents as human-like with remarkable ease. We're willing, even, to grant not just animacy but intention to animated geometric shapes on a screen. This phenomenon was perhaps most famously investigated in 1944 by Smith College psychologists Fritz Heider and Marianne Simmel. In one experiment, the researchers instructed their undergraduate experiment participants to watch this movie and "write down what happened." Despite the fact that the interactions among the objects could be described in strictly geometrical terms, only one of thirty-four participants did so. The rest described the interaction between the big and small triangles as a fight. The interaction between the big triangle and the circle was usually referred to as a chase. The shapes always controlled the "door," as if they operated it with intention, rather than the door controlling the shapes. An overwhelming majority also used human personality traits to describe the shapes. The big triangle was thought of as mean, aggressive, angry. He was a bully. And it was universally described using male pronouns. The circle was described as afraid, fearful, shy. The majority of participants used female pronouns to describe her. My grandmother and her family remained in the Beregszas ghetto for six weeks, housed in a brick factory, before they were taken to Auschwitz-Birkenau. That's the last time that my grandmother saw her parents, and her two younger sisters. How can it be that humans so easily imbue human-like characteristics onto entities with only the weakest echoes of humanity but just as easily dehumanize other people so effortlessly that they can participate in the most heinous of atrocities? Epley, Waytz, and Cacioppo think that dehumanization is, from a psychological perspective, the inverse of anthropomorphism. "Dehumanization is troublesome for most because of the very inverse process of stripping other humans of their moral agency and enabling them to be treated as objects," they say. Their theory for anthropomorphism holds that the phenomenon is particularly likely to occur out of a need for social bonding. Just as hungry people need food, lonely people need social interaction. "Isolation, exclusion, or a feeling of disconnection from others is the hallmark of social pain, and people experiencing this social pain take active steps toward alleviation by seeking out meaningful social connections with others," the researchers argue, and one method for doing so is to anthropomorphize non-human entities. This pattern doesn't only explain Tom Hanks's relationship with a volleyball in Cast Away, but also the elderly pet owner who treats his or her cat a little bit too much like a spouse. Indeed, when people are primed to feel lonely, they become more likely to use anthropomorphic terms to describe their relationship with their pets. On the other hand, when members of an ingroup are already highly connected, they aren't particularly starved for social engagement. That may be part of what was so insidious about the Nazi Party in 1940s Germany. By explicitly creating such a strong, overt ingroup – people wore the same clothes, for example, and participated in the same ritualized behaviors – they were perhaps even more likely to fail to grant human-like characteristics to outgroup members, like the Jews and Roma and others. They simply didn't need to. After four months, my grandmother and her older sister were taken together to the Fallersleben work camp in Germany, where they were put to work on an assembly line in an airplane factory. After eight months there, they were taken to Salzwedel, yet another German work camp, where they produced ammunition. The tale of the Holocaust and other genocides in modern history remind us that it is as easy to dehumanize members of our own species as it is to find humanity in the non-human. Flipping the switch to blind oneself to the humanity of others is not even a uniquely human trait. Chimpanzees, for example, are primed to react aggressively to any unfamiliar individual. Some researchers believe that contagious yawning reflects empathy. If one individual doesn't "catch" a yawn from another, it may be because he or she doesn't empathize with him or her. Indeed, one study conducted by Matthew Campbell and Frans de Waal found that chimpanzees could catch yawns from members of their own social group, but not from unfamiliar strangers. What does this mean for our own species? Are we doomed to treat outgroup members with hostility, or at best with a sense of unempathic detachment? Maybe not. Just three weeks after being put to work at the Salzwedel labor camp, on May 14, 1945, the British Army liberated my grandmother and her older sister. A subsequent study by Campbell and de Waal showed that chimpanzees could catch a yawn from a human, familiar or not, but yawns from baboons remained uncontagious. That suggests something hopeful for the development of empathy: that familiarity itself might be sufficient. "For our subjects, a different species (but one they have a history of positive experiences with) was more potent at eliciting empathy-based contagion than outsiders of their own species," they write. That explains why familiar humans elicit an empathic response, but not unfamiliar individuals. "Students come, complete their studies and leave, and care staff gain and lose members in the normal course of people changing jobs. The chimpanzees may have been conditioned to take a positive view of humans in general, not just the ones that they know," they say. There is a principle in psychology called the "mere exposure effect," which posits that exposure itself could facilitate increased liking for an unfamiliar individual. If familiarity could also increase empathy, then it might be enough to avoid dehumanization. "This flexibility," Campbell and de Waal say, "opens a door to examining how we can modify who chimpanzees will form an empathy-based connection with and how strongly. Understanding this flexibility in social engagement may help explain the proximate mechanisms that allow for switching between cooperation and competition within chimpanzee and human societies."